The sample application https://github.com/steinarb/jersey-demo demonstrates how to use Jersey to provide a REST API from a Declarative Services (DS) component registering with the Pax Web Whiteboard Extender in apache karaf. The way Jersey works is that it initially scans a package in the classpath for classes with JAX-RS annotations (e.g. @Path, @GET, @POST), and matches @Path annotations to possible endpoints in the REST API. When Jersey receives a REST call to a endpoint that matches a resource, Jersey will instanciate the appropriate resource class, call a method on the instanciated resource and then release the resource to Java garbage collection. To be able to do something useful in these resource objects we use HK2 to dependency inject OSGi services. Note: The copyOfExistingConfig object at this point contains both the initial configuration created by the ServletContainer itself, and the two added OSGi services for dependency injection. The react.js application is webpack‘d into a single bundle.js file. The packing is done by the frontend-maven-plugin (i.e. no local node.js installation required). I use aptly to deliver my unofficial debian packages both to myself and others that might be interested. However I’ve found that using aptly to do package development is a bad idea, because you can’t (by design, probably) overwrite packages in an aptly archive. You can only create new versions. For some installation tests it’s OK to use “dpkg –install”. But if your package needs to pull in depdencies, or if you wish to test a package upgrade, you need to use APT. This article explains how to create a fake debian repository for use in package development. This is used to e.g. test that a package is able to install its dependencies. Apache Karaf is a good platform for deploying OSGi based applications. 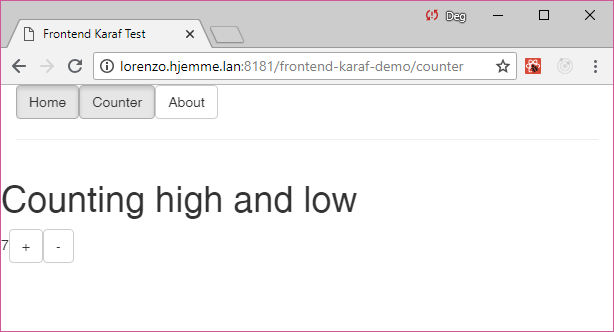 Karaf is also a good platform for testing and debugging these applications. This article describes how to test and debug OSGi bundles and OSGi applications with karaf and eclipse. For more detail, read on. In the installation example earlier in this article the runtime requirements of the sample application were first installed into karaf (pax-http-whiteboard and adapter-for-osgi-logservice). Until the RFP (Request For Packaging) bug for karaf in the debian bug tracker is resolved, here is an APT archive with a karaf package for debian (architecture “all”). The package is created using native debian packaging tools, and built from a source tarball and the APT archive itself is created, using aptly. The package has been tested on Debian 9 “stretch” (the current stable), amd64. Note! This is an improvement over the packaging in Installing apache karaf on debian stretch, this package is packaged using native debian packaging tools instead of fpm, and is built from the karaf source tarball instead of the karaf binary tarball. Apache karaf is an OSGi container and application server that is provisioned from maven, and has an ssh server. Basically it is possible to start an empty karaf, ssh in and give some commands to install an application using maven. There still isn’t a native .deb package on maven (see the RFP (Request For Packaging) bug for karaf in the debian bug tracker), but this package can be installed from my own maven repository. After this, there will be a karaf-*.deb package in the directory above the karaf-debian directory. This article describes how to set up a debian archive with aptly on a debian 9 “stretch” computer, served by an nginx web server. Note! Without a concrete architecture in place, aptly refuses to publish. So add an architecture here, even you are going to publish packages with architecture “all” (e.g. java, python, shell script). In the example I’m using “amd64” which, despite its name, is appropriate for modern 64 bit intel chips (i5 or i7 of various generations). Your APT artchive is now up and running. Future additions and updates of existing packages can be done as your regular user, with no need to log in as root during the process.